I just heard someone say the other day that we are less than 90 days away from Christmas. Can you believe that? Get a head start on your Christmas cards and join me for my annual October Christmas Class. You'll make 20 cards for $30 complete with matching envelopes (4 cards each of 5 different designs). The cards feature stamp sets and accessories (ribbon, of course!) in the current 2010-2011 Idea Book & Catalog plus brand new products in the Holiday Mini Catalog! Sunday, October 17 @ 2 p.m.
Saturday, October 30 @ 9 a.m.
Register by Wednesday, October 13. Pre-payment is required. There are only 8 spots available. Finally! Here are the pictures from my Christmas in August class. Enjoy! Thanks to Ilina Crouse for inspiration on two of the card designs! Here's one of the card designs we'll be making at my Christmas in August class in a couple of weeks. Don't forget that today is the deadline to register. Join me for a Christmas in August Card Class! You'll make 20 cards for $30 complete with matching envelopes (4 cards each of 5 different designs). The cards will feature stamp sets and accessories (ribbon, of course!) 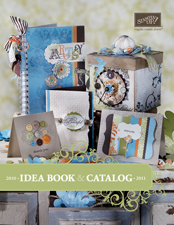 in the current 2010-2011 Idea Book & Catalog plus brand new products in the Holiday Mini Catalog! Sunday, August 22 @ 2 p.m.
Register by Monday, August 9. Pre-payment is required. All classes are held at my home. 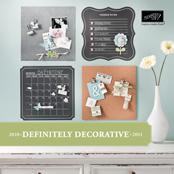 In just two short days you can order from Stampin’ Up!’s new 2010-2011 Idea Book & Catalog! It is even more incredible than this past year’s catalog. There are so many new products—patterned paper, accessories, and especially the In Colors that will now be available for two years! Stampin’ Up! has even renovated their color families…yes, some of your favorite In Colors are BACK! Come browse the new catalog and experience the excitement at my 2010-2011 New Catalog Party. I have some fabulous projects planned. The cost is only $5. I just realized I haven't shared the cards we made at my last "4 Cards for $5" class. A big thanks to all the ideas I found on SCS! Read on for deets about my Write Stuff Class next month! You will make 8 super cute cards using the Write Stuff Specialty Paper featuring textured, cover weight die cuts and coordinating patterned paper. You and a class member will split an entire package of the Write Stuff Specialty Paper. You get to take home your half of all the paper and die cuts that are left!! Each card uses Old Olive 5/8" grosgrain ribbon. The cost is $20. Prepayment is required. There are only 8 spots available so RSVP quickly! Can't attend the class but would like to purchase a kit? This class would be perfect for you to use your favorite sentiment stamp set and add-on a Soft Suede Classic Ink Pad for $5 more. I am THRILLED to announce that I’ll be holding a “4 Cards for $5” class on Sunday, May 16 from 2-4 p.m. at my house. The class will feature new products from the Summer Mini Catalog including the very popular Elements of Style stamp set. If you haven’t tried the new clear-mount stamps you won’t want to miss this! You’ll also get to try the new Smooch Spritz and a Décor Stencil. Register by Friday, May 14. There are a limited number of spaces available. Join me at the end of the month for a Sending Love Class to celebrate Valentine’s Day! The class includes the projects pictured below: two Valentine’s day cards (complete with envelopes), a matchbox for a friend (filled with chocolate), and an amazing wooden Valentine’s Day frame for your significant other or another loved one. The cost is only $10. We’ll be using lots of new products—including a punch from the Sale-A-Bration brochure, several new clear-mount stamps, the Sending Love Specialty Designer Series paper, and the new Perfect Polka Dots new textured impressions folder. You do not want to miss this class! Saturday, January 30, 2010 @ 10 a.m.
Register by Wednesday, January 27. Pre-payment is required. There are a limited number of spaces available.